But, just ahead of the three title fights sees the return of the former welterweight champion, the Irish Nigerian Henry Fadipe. A man hell bent on reclaiming his EFC belt. The only man willing to enter the Hexagon to face Fadipe is DRC’s Bruno ‘The Major’ Mukulu, and a war is what Mukulu wants to bring. Set to open the main card with a bang, sees the rising super star Wessel ‘Wess Express’ Mostert face his biggest challenge yet in Cameroon’s Nico ‘The Lion’ Yamdjie. Two behemoth heavyweights will collide. All this and so much more at EFC 54, don`t miss it! Don’t miss a second of the action! Get to the events or watch them live via our broadcasters. Broadcast and ticket information at www.efcworldwide.com. 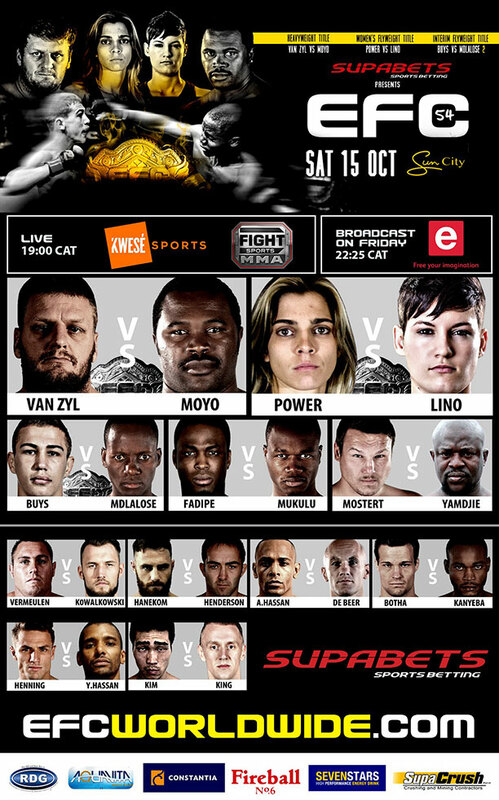 EFC 54: Van Zyl vs Moyo, Power vs Lino, Buys vs Mdlalose presented by SUPABETS, takes place on Saturday 15 October 2016 at Sun City, North West. Tickets are on sale now at www.computicket.com, and the 5 main card bouts will be broadcast live on kwesesports.com (Sub-Saharan Africa) and Kwesé Free Sports (Kenya) starting at 20:00 (CAT) and on e.tv (South Africa) on Friday 21 October after the 20:30 (CAT) movie. Full broadcast details available on www.efcworldwide.com.